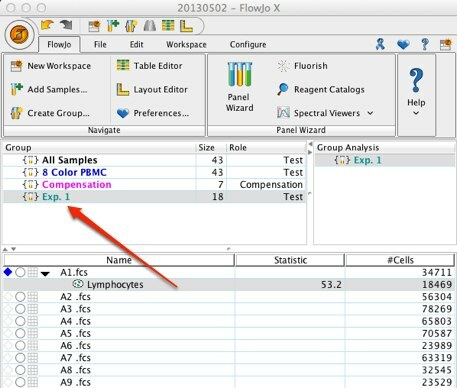 One of the biggest advantages of FlowJo is the ability to copy analyses (gates, statistics, kinetics, cell cycles, etc.) from one sample to another by drag and drop. In general, this is accomplished by clicking on the analysis (a gate, statistic, or population node), and dragging it to the destination. The node is added on to the destination node as a “child” of the destination (i.e., it is applied only to events which fall within the population you drop the analysis on). You can drag entire trees around this way, selecting children, parents, or multiple nodes accomplished by Control-Click (Mac) or Shift-Click (PC). Note that if you drag a sub-population onto a population which already has a sub-population with the same name as the one you are copying, then FlowJo asks if you want to replace it. The reason for this is that FlowJo does not allow you to have two sub-populations with the same name at the same level of analysis. These options are more fully described in the pages on replacing nodes. 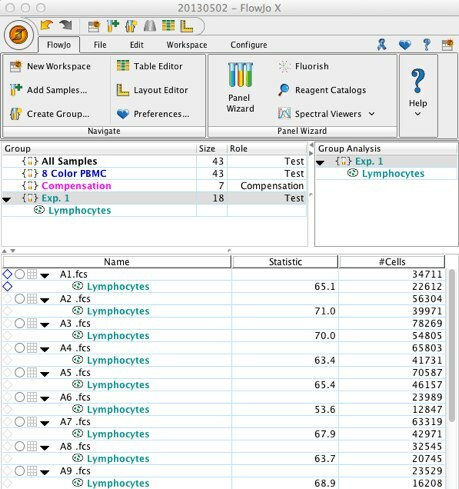 You can automate the process of applying analyses to samples by using groups. You can add analyses to a group; then every sample which belongs to the group or is later added to the group gets those analyses. This is one of the powerful batch analysis features of FlowJo. You may view an example of group-based analysis. You can drag analyses across workspaces; in other words, you can drag an analysis node from one workspace and drop it onto a sample or a group in a different workspace. You need to have both workspace windows open to do this; simply drag from one to the other.